I’ve been tinkering with a quick lash-up of Wayne Burdick, n6kr’s famous ‘Forty-9er’ receiver, implemented on an Arduino shield and tuned by one of my DDS systems. 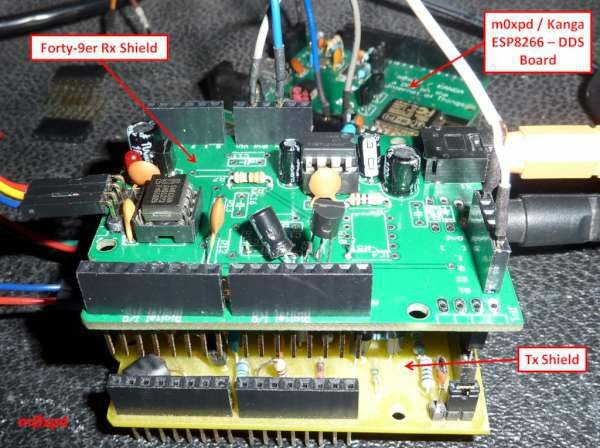 Regular readers will remember how I tried running my Kanga / m0xpd Sudden-inspired receiver shield under the control of the new DDS on the Internet of Things board and found the latter to cause a lot of noise problems. I stripped out unnecessary active stages in the Rx shield to try to manage some of the receiver’s susceptibility to the hostile EM environment generated by the ESP8266 and realised that I was left with something which resembled not only a Sudden but also any other SA602 / LM386 receiver – including the Forty-9er. More details at m0xpd’s blog. This entry was posted on Friday, December 23rd, 2016 at 2:52 pm	and is filed under digital radio data, RF. You can follow any responses to this entry through the RSS 2.0 feed. You can skip to the end and leave a response. Pinging is currently not allowed.